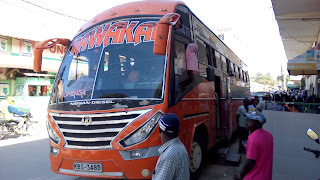 It was such a sunny day as I waited eagerly for my favourite Lamu bus to arrive safely in Malindi. I had missed Mombasa for two weeks now since i departed from the town to exercise my solemnly duty and right to vote in power my favourite candidates. I had stayed at home long enough to ensure that no election violence could caught up with me as it did back in 2007. I made a call to my conductor inquiring of the whereabouts of the bus but i wasn't lucky this time, he was on his leave. I made a call to the office and was informed that the bus was past Tarasaa Junction. I really hate the many excuses the government have for the daily Bus Escorts to and from Lamu in which buses are delayed for hours in the name of protecting its citizens from the terror group, Al Shabaab. Never mind, i had an hour or so to get myself ready, have my lunch and get myself out of the house and head stray to the usual bus stop. I left home at 2.30pm headed straight to the office. Am informed that the bus had a breakdown so had no option but to travel onboard Tawakal bus. The Bus Exterior is nicely furnished with its graffiti carefully written. Its interior is colourful with the red seats nicely placed. I just loved the bus. I took my seat as no. 24 waiting ready for its departure to Mombasa Town. 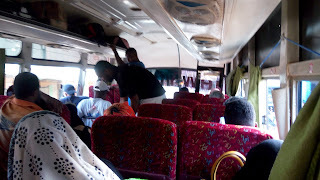 The ride was smooth, I can say the driver's experience with this kinda bus was exceptional. I arrived home safely though exhausted due to the limited legroom space the bus had designed with. Sometimes us people of long legs are really disadvantaged.